It was only the end of last year that I heard about Tim Rich’s BSBI New Year “Plants in Flower” listings. It wasn’t until December that I heard about it, but I determined to give it whirl. I have been year-listing in various groups of organism since 1st January 1977, (there will be more of that in another blog shortly). January 1st 2015 here in Sussex turned out to be a miserable, overcast and drizzly day. At the time, I thought that listing was confined to three hours on January 1st. 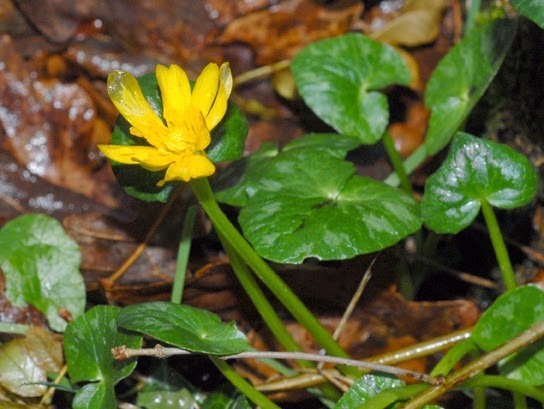 I had noted Cymbalaria muralis in the centre of the village, and after finding five species in a garden, including Ranunculus ficaria, which I now evidently have to remember to call Ficaria verna, I had noted a few species on a roadside going to the local supermarket. After this, apart from stretches of dual carriageway verges between Worthing and Arundel, that I had noted in mid-December to be rich in plants still in flower, I had no prior information or plans. With my wife driving to give me the best chance of seeing plants on verges, we set off for the stretch of road on the A27 between Worthing and Arundel. West Sussex County Council in their lack of wisdom for the requirements of New Year botanists, had mown all the verges to a maximum of one inch high. All I got between Burgess Hill and the A27 was Heracleum sphodylium, Petasites fragrans and considerable eye strain! Eventually we found a lay-by on the A27, and with traffic whizzing past at high speed on the road, I set off to do some recording. The productive tall ruderal vegetation I had noted was now blackened by frost, and the vast majority of the plants I had seen just a fortnight earlier were now dried up, shrivelled and lacked any flowers. Things like Sonchus asper, Senecio jacobaea and Picris echioides were all gone. Walking the four hundred yards odd to the next lay-by where my wife had parked, I added just six species to my list. Not good! Time was passing. I decided to go down to the coast at Angmering in the hopes that the sea might have ameliorated the recent frosts, and all I added was Ranunculus repens. However frost damage did seem less. Although I thought I had twenty five species, I had to remove Dactylis glomerata and Lolium perenne as the plants had no anthers, and Mistletoe which, at over fifty feet up in a tree, could not have been confirmed with the presence of its microscopic flowers! This reduced me to 22 species. This did not impress me, especially when I heard of botanists in West Sussex, and Tim Rich himself in Cardiff, achieving over sixty. When I got home, I reviewed the day, and realised that I needed to be closer to the sea all day to minimise frost impact, and to include industrial sites with waste ground. Next year, I thought to myself, I must take this into account, and do a series of reconnaissance trips to be sure of the most productive areas to visit. I just wished I could go and do more surveying on the 2nd January. Later that evening, my wife who had been studying the internet, found that we actually had until January 3rd, and that we could do 3 three hour listings if we wanted, from different areas. We checked the weather forecast, and the next day was reckoned to be warm and sunny. We decided to go and list Eastbourne, and not start our three hours till we got there. About twenty years ago, as a freelance ecologist specialising in botany, I had had a contract to study all potential areas of ecological interest in the borough. Of particular interest were areas surrounding beach huts, cliffs on which several exotic species such as Carpobrotus edulis had become naturalised, and most notably large industrial estates. Parking anywhere near the extensive cliffs proved impossible. The whole world and his wife were on the road seeking coastal sunshine, and/or bargains in the shops. Most roads were at a standstill, and parking places were all full. So, beach huts next. What beach huts? I could find none. A brief stop to look at a recently established verge added five species, but as throughout Eastbourne, the vegetation had been razed to a maximum of one inch. With the desperate traffic, blinding sunshine to the south west, and the lack of potential for flowers, I began to become very frustrated. We left for my supposed industrial botanical paradise. We found an area with tall vegetation which was all quite dead. Weed killers had evidently been used. A chap came over from an office. “Are you lost? Can I help?” He asked. I explained what we were up to. He was very doubtful whether we would find anything in flower in the whole of Eastbourne at this time of year. “My landlord insists I mow all the grass,” he told us, “And this place [the derelict warehouse we were parked beside] hasn’t been used for two years. It’s going to be developed and turned into a new supermarket site.” Well, if a derelict site was no good, how on earth could I expect anywhere else not to have been ruined botanically either by mowing or the use of a weed killer? I did find one area of disturbed ground close to a railway in a housing estate. This added six species including Senecio sylvaticus, one of the best species of the whole two days. We left this area, and tried a housing estate back from the sea with less traffic. It was botanically barren, and all we achieved was to join traffic waiting at a particularly time-consuming level crossing. A visit to a woodland park produced nothing, so we decided to try a churchyard to the north of Eastbourne where there was recently disturbed ground next to a rebuilt wall. In the event, the churchyard added five species including Primula vulgaris. Churchyards could be one possible answer for next January. One problem I now have is what constitutes a species being in flower. I took it to mean if I could see any petals that had the colour of the expected flower. With just a recently shrivelled flower head, this could not be used. However, in the sort of weather we had had on the 1st, I recorded Stellaria media if white petal tips could be seen extending from the top of the bud. When year listing, I always count grass species if the head is green. This year, all I could see with anthers was Poa annua. Later in the year, the problem of recording sedges in flower would present a considerable problem. I guess sedges would have to be identified in fruit, and plants still in flower in the colony could be added. Planning the three hours by doing reconnaissance during the year, and especially in the run up to Christmas is essential. Good industrial sites, well vegetated walls and fairly recently disturbed road verges with tall, ruderal vegetation should be productive. The best botanical sites and SSSIs will probably add nothing or next to nothing. Such vaguely competitive exercises are great fun, and get the participant to think ecologically, which is excellent. The two days in the field have taught me much, and weather permitting, I hope to be much more successful. If frost proved to be a problem, perhaps we’ll try and book into a Premier Inn somewhere in the West Country. Anyway, the most important aspect of this is that it has added a new, and enjoyable dimension to New Year’s Day. My bird list has taken second place for the first time since 1984!